Greetings, Champions! The time has come for the last of the Frog Prince/Timeless Fairy Tale themed posts. (At least until 12 Dancing Princesses launches, which sadly has been pushed back to early January since it is turning out longer than expected. Sheesh.) Today we’re going to cover what has been looming on the horizon of the Timeless Fairy Tales’ world since Beauty and the Beast. War. For starters, I need to make a quick statement about war. It’s not glorious, it’s horrible, awful, and my heart goes out to anyone who has fought in a war or experienced the effects of war. Additionally, the battles fought in the Timeless Fairy Tales won’t reflect human conflicts but the battle between good and evil so it’s not going to be as mind-shatteringly horrible as it is in real life. Okay, let’s proceed. With the ending of Frog Prince revealing that few surviving Chosen have plotted and grown over the century and are the cause of all the conflicts in the Continent, I had so many of you asking how I thought to do this, and how I was able to draw so many threads together. The short answer is history. I am a big fan of history–mostly because I find it interesting with all the twists and turns, but also because Scholar Pierre was right. We constantly repeat history, or at least we repeat specific themes in history. But when it comes to starting wars there’s usually a couple of events that will serve as catalysts. 1) Someone royal (or rich, preferably both) is killed or mysteriously goes missing. Many credit the assassination of Franz Ferdinand as starting World War I. King Richard III assumedly killed his two nephews, princes and the rightful heirs to the throne, then dealt with two separate rebellions and was slain in battle. 2) The people themselves rebel. The biggest examples of this are the American Revolution and the French Revolution. There’s obviously many many more reasons for wars, but these specific two are the ones I’m most familiar with in my admittedly very small knowledge of history. Since I knew I wanted the enemy, the Chosen, to represent a dark ideology (because, spoiler, they’ve only gotten worse every century since Rakel kicked them out of Verglas) I knew I wanted to underline how different the countries are and the politics between them (ie: the strained relationship between Loire and Arcainia, Verglas being in debt to Arcainia, Erlauf not winning any friend competitions due to invading Trieux, Ringsted being unwillingly isolated) and then use the darkness to bring them together. Similarly, I knew the most effective way to make the countries feel the strain so they would be willing to come together was to put pressure on their people (Remember reason 2) AND the royal families. This was actually pretty easy to ponder through, mostly because of Angelique. So how did I figure out how to create all these individual countries and portray the politics between them so it would be more dynamic when I brought them together? The answer is City governments. To run a city, things are broken out into departments, like: library department, parks and rec, Administration, fire/EMS, water and sewer, etc. While the city departments work to do what’s best for the city and to serve it, just as it is in any organization the departments have differing opinions on how to achieve that. The city will have a set budget, after all, and departments are always desperate to increase their budget so they can do more great things! But that means Fire/EMS–who save people and serve the front lines–might not be very sympathetic to the library director who really wants to get a new computer room. And Administration–who also handles accounting–might get really mad at fire/ems when they accidentally buy too many chemicals and blow their budget. However, there were always things the departments would work together for no matter what they thought of each other. The Fire/EMS department might have a show-and-tell day at the library, the administration office will sell tickets to the policemen breakfast, employees from water and sewer will run in a marathon held to raise funds for park and rec, and on it goes. So you mix up slightly contentious countries, combine it with strained royal families, add in all the catastrophic events from the fairy tales and what do you have? A continent filled with people who are facing some pretty grim odds. But while you often see the toll my books take on the royal family, you don’t often get to see the average citizens the royals are very concerned with. So how can I show how BAD things are when I can only dialog exchanged between my princes and princesses to deliver bad news? Again, the answer is in Angelique. Angelique reminds you of all the storms, evil witches, invasions, and ogres the people have had to deal with, which adds darkness to the already black depths of the evil the continent is facing. She is really the key to the entire series, not just because of her power but because of her constant presence. Rakel freed people wherever she went in Verglas. Angelique, however, beats back the darkness so it never has a chance to settle. But that brings about quite possibly the most important question in the series: How long can Angelique hold out against strain and exhaustion and keep fighting back? How much more can she do? Thanks for reading, Champions! I hope you found this information dump interesting! I’ve been keeping myself in a chronological mindcheck every time I read how exhausted Angelique is. Man, that poor woman needs a sidekick. I’m always so interested in reading how her dress changes to reflect how worn she is. I really wish we could see this in movies. If you ever get a screen deal, let me know! I would love to be involved in that! Ahahaha, yeah, I do feel bad for Angelique as well. 12 Dancing Princesses will actually give us a pretty good snapshot of how she is mentally doing, and where she’ll be going from here. Yes movies! same same same! Approximately how long do I have to wait for Angelique’s story?! I really want to know more about her and for her to get her happily ever after! Ahh, yes! 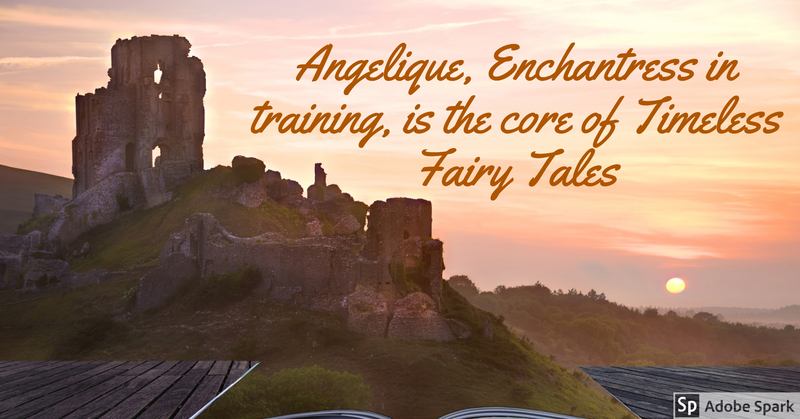 You make a valid point: What is Angelique’s Happily Ever After like? Does she have a Prince Charming? And if so, *who*? 😉 Haha the anticipation just got so much better! Hi! I’m super excited for all of your books, and I can’t wait to know more about Angelique! I wanted to mention that, as a Latin student, I really appreciate the bits you slip in here and there, like Tenebris and Castle Dolor. It’s just so fun when I notice them! Also, the fight scene in Sleeping Beauty happens about a yearish after the end of Swan Lake. I found Sleeping Beauty’s time line a bit confusing because it contained the WHOLE time line of the series. Even through Frog Prince, it’s kinda the Beginning and Ending of the current time line, as Frog Prince happens while Rose is sleeping. What in the world happened to Enchanter Evariste?! Is the Veneno Conclave and the Chosen like Shield and Hydra? Also I apologise if this was obvious but why were the Swan Smugglers already with Angelique in Sleeping Beauty? She couldn’t have known that she would have to steal something right? And can I just say that I cannot wait for Angelique?? This is going to be SO GOOD!!!! I’m really glad to hear you feel like I got it! I try to make my countries reflect more real-life issues than your average fantasy book. (That’s why they deal with deficits, budgeting, agriculture and the like) but even when I put hours of research into it I feel like I barely scratch the surface. Uggghh! And I REALLY hope you like Angelique’s story! She plays a bigger role than usual in both 12 Dancing Princesses, and in particular for Snow White, so you’ll get to see her a lot more in the future. Ooh, also I just finished reading the Frog Prince (again) and there was a list of your books at the back. The 12 Dancing Princesses was on it, but it mysteriously didn’t have a link . . . 😉 oh well . . . The last couple books reference the girl in the glass coffin. Is this Snow White, and if so, it happens between current times and Rakel’s timeframe? Love your stories, love your writing. Just reread the whole series again. Can’t wait for the next books. Yes, replying to myself…. While reading previous blog posts, I was able to get my question answered. No, not the same, and the girl in the glass coffin will have her own short series. Wow! This was really great and helpful! Thanks for this wonderful info dump. Also, this made me laugh 🙂 I think we think alike in some ways, Kitty. Just once again, thanks for everything, I’m really coming to appreciate clean romance more and more and I think that you have done a great job in filling this niche. You really are so wonderful, and I hope you know how much I appreciate these books. Thank you for that explanation. I love how you have the fairy tales reflect real life situations. In my opinion, it makes your stories so much better, because they reflect the real way the world works and not how some people want it to work. In other words, the consequences of your characters choices are believable because they are consistent with real life consequences. I’ve read stories where the consequences were so contrived I just couldn’t enjoy the story. It was too fake in that regard. So, once again, thank you for writing good stories that stay true to true principles. Your humour is delightful and the adventures are compelling. I’m so looking forward to the 12 Dancing Princesses and Snow White. Thanks, Arletta, for the high praise! 🙂 I do try to work a lot on my stories conflict and my characters’ growth. It’s really FUN to have an overpowered main character–like Rakel–but I still want her to be affected by real life issues. In particular I REALLY want my countries to actually operate like real countries. I’ve played a lot of video games and most often country governments only exist for the sake of the story, which is a missed opportunity in my opinion! So, Angelique will be our captain America? Cool. I would like this comment 1,000 times if I could. Angelique as Captain America? I’m in!! !